Nov 28, 2016: The news of Billionaire trash-talker Donald Trump as the President-Elect of the United States following November 8 election caught much of the world by surprise. This was no ordinary election. The Middle East still reeling with the aftermath of the Arab Spring with ongoing wars in Syria, Yemen, Libya, and Iraq; Europe recovering from the terrorist attacks, flux of Refugees, and BrExit; Turkey — with stockpiles of NATO’s nuclear weapons — in turmoil transformed from Ataturk’s secular to ‘Sultan’ Erdogan’s Islamic Emirate; and a resurgent Taliban and Pakistani-TTP as ISIS that has NATO on its knees in Afghanistan. The US election came at a time when the world was seeking reassurance and leadership from the United States of America — arguably the only remaining superpower in the world. There was reason for high expectations. For months before election, on the day of Election, and hours before the final result, polls suggested major victory for the Democratic Party. The ‘glass ceiling’ wasn’t just about to break, it was set to be shattered with the Women President succeeding the African-American President — both a first since the declaration of independence from Great Britain in 1776. How could the American Media and its Political Pundits be so completely wrong in their prediction of the next President-Elect? For those unfamiliar with the American Government and Election Process, it is good to take a moment and review how it works. On the Election Day, voters were set to elect the President, one third of Senate, members of House of Representatives, Judges, members of Board of Education, as well as local county officials. At stake was the Presidency, the House of Representatives, the Senate, and the most important of all — the Supreme Court. The Republican Party’s epic win — polls suggested major upset in the Republican controlled House, the Senate, and the Presidency — could only happen because of an epic failure on the Democratic Party side. There are many theories on How Hillary Clinton lost and How Donald Trump won. Understandably, complex set of factors were involved behind the unpredictable Election outcome. For this article, we will focus on two key issues that may have tilted the odds in Republican Party’s favor. America has not seen a candidate like Senator Bernie Sanders in the Presidential Election. 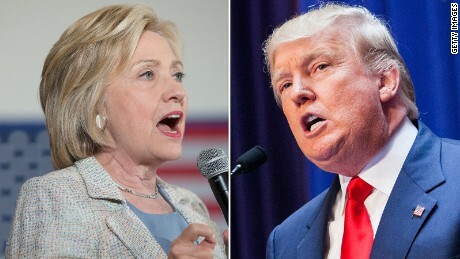 As a Caucasian (white) candidate, he has a track record of fighting against segregation. As the only Jew in the race, he criticized Israel over Palestine issue, as well as skipped the Pro-Israel AIPAC conference — considered ‘career suicide’ for an American politician. If that wasn’t enough, his campaign went after the most powerful and influential ‘Wall Street’ — the billionaire class that makes the ‘Status Quo’ of the United States. In a ‘normal’ election year, candidate like Sanders wouldn’t have a chance. But this election cycle favored outside candidates as more and more Americans became dismayed with the partisan politics in a dysfunctional Washington. In the United States, the State-by-State Primary or Caucus process within a political party determines their party nominee for the Presidency. The rules are set by each Party’s organization, and differ from State to State. In the Democratic Party, the candidate has to win 2,382 out of 4,763 delegates to become the nominee. Apart from the ‘delegates’, the Democratic Party also has what is known as ‘Super Delegates.’ They are current and former party loyalists in high positions of power free to give their ‘one delegate vote’ to a candidate of choice within the party. The only purpose of ‘Super Delegate’ is to prevent outsiders like Bernie Sanders taking over the party and to ensure status-quo like Hillary Clinton always win the party ticket. The Primary or Caucus process goes for months (Feb-June) with each State holding their Primary or Caucus on a predetermined date set by the Party’s organization. The analysis of Caucus and Primary results from the first two State — Iowa and New Hampshire — hints at the epic failure of the Democratic Party on November 8 Election day. 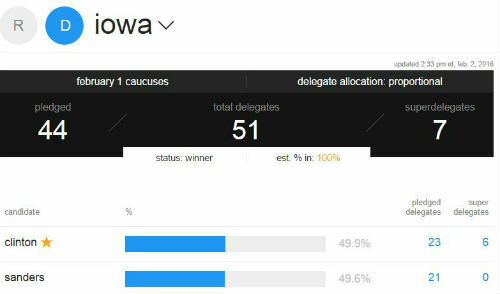 In Iowa, during a neck-and-neck competition (Clinton 49.9% to Sanders 49.6%), the Super Delegates tilted the result in favor of Clinton even when both were virtually tied. 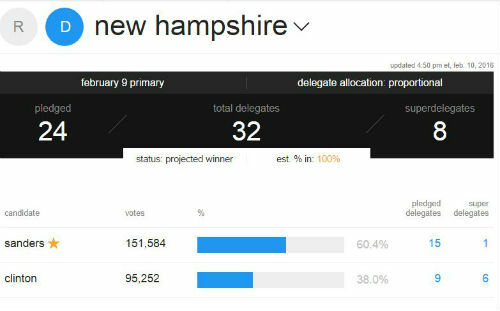 Likewise, in New Hampshire, Sanders crushed Clinton with a 60.8% to 38% but once again the Super Delegates came to Clinton’s rescue heavily favoring her over Democratic Party’s voters. The United States elections are a game of very high stakes. The Democratic Party machine wasn’t just going to rely on the Super Delegates to ensure Clinton’s win. In July, WikiLeaks released hacked DNC emails showing party officials — Chairperson and Interim Chairperson of Democratic National Committee (DNC) in particular — systematically undermined Sander’s campaign on the main stream media. Americans are obsessed with winning and nowhere is this more visible than election. Polls are supreme and voters will not vote for any candidate if a perception can be created that they will not win. The Sanders campaign had no chance of winning. He was running against The Clinton ‘dynasty’, media, the Democratic Party organization, and a popular President (Obama) of his own party. In delivering the Party election to Clinton, the Democratic Party ignored all signs of trouble with her candidacy and alienated all Sanders supporters whose votes were crucial for winning the Presidential election. In previous article, we briefly explained how the Supreme Court judges are appointed by the President. For those interested, The Supreme Court After Scalia by Jeffrey Toobin is an excellent article explaining the importance of Supreme Court to the Presidential Election of November 8 following death of Conservative Justice, Antonin Scalia. Let’s understand the broader Supreme Court issue in layman terms. What is the significance of Supreme Court to the Republican Party? The nine justices of the Supreme Court — the highest court of the land — deals with landmark cases that are usually highly controversial. To recap, while the US President can only remain in office for eight years, the Supreme Court Justices are appointed for their life time. Generally the Supreme Court has a delicate balance between secular and conservative Justices. The new President would not only fill the vacant seat of late Justice Antonin Scalia, but possibly make several other appointments if he remained in office for next eight years. A Republican President would most certainly appoint Conservative Judges, tilting the court heavily in favor of Conservative Christians possibly for the next 40 to 50 years. What that means is that the landmark cases — for example, Abortion, LGBT Rights, Environment, to name a few — will be decided in accordance with the biblical laws. What is the relevance of Supreme Court to Trump’s win? The nomination of Donald Trump as Republican Party’s candidate almost split the party. A good half of Republicans were alarmed by Trump’s hate-filled campaign rhetoric. Many notables of the party were at pains voting for Trump, some actually went to the other extreme voting for Clinton. This fragmentation in the party that almost carried to the Election Day, created an impression that lack of voter enthusiasm could cost Republicans the House, the Senate, and the Presidency. The Political Pundits, however, miscalculated one major factor — the Supreme Court — that made voting the ‘moral duty’ for every Republican. Throughout the Election cycle, the two factors in this article consistently surfaced during our discussions with the Hazara American community. We noted in this article why most Hazara Americans favored Bernie Sanders over Hillary Clinton. The way Democratic Party undermined Sanders campaign was unforgivable in their eyes. If their disenfranchisement was any indication of the larger trend, then no polls were designed to capture this discontent and how it will manifest itself as a historic loss for the Democratic Party on November 8 Election day. Likewise, on the Republican side, several community members working in professional capacity mentioned that their ‘conservative colleagues’ weren’t flatly ruling out voting for Trump. The issue was Supreme Court. In our interpretation, it appeared that the issue of Supreme Court made voting a moral obligation. If this thought reflected majority of Republican voters, then once again, no polls were capturing this resolve that gave the Republican Party their historic win on November 8 election day. Trump Gettysburg address: What will he do in his first 100 days? The Hazara American Community contributed to this article.